LIVE REPORT: WING WORKS - RAVVE OF MY TRINITY @ Shibuya WWW | VKH Press – J-Rock & Visual Kei Coverage Worldwide! 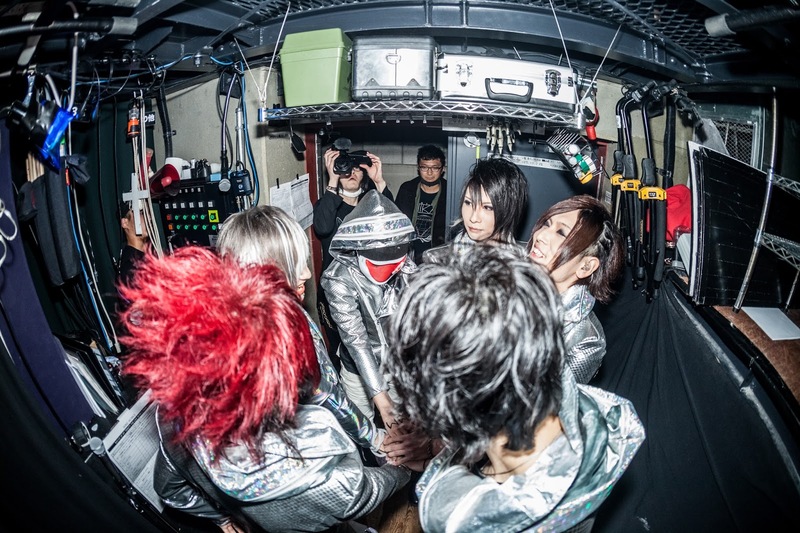 On March 21st at Shibuya WWW, WING WORKS fans witnessed an exciting new chapter of the “HYBRID SHOCK MUSIC” titled “RAVVE OF MY TRINITY - The Live Works Final”. WING WORKS, the brainchild of RYO:SUKE along with his support band the WING-MEN, continued to explore the themes of humanity, dreams, the past, present and future. Before the start of the show, the venue was filled with fans eagerly waiting for the curtain to open. Although WWW is a relatively small venue, the setup of the area gave excellent visibility to even those standing at the back. Start time was listed as 6:00 pm and at around 6:10, the live began. The first thing you noticed was that most of the stage was obscured by a plastic awning. There wasn’t much that could be seen but after a moment’s pause, a screen at the back of the stage lit up. Words began scrolling across the screen in both English and Japanese. We were told a story that took us to the year 2033. The world was in ruins and humanity had lost all hope. The only way to set things right was to send an android, “the one with silver wings” back to the year 2015 in hopes that he could change the past and save the future. With the scene set, the WING WORKS logo flashed on screen and fast-paced techno music began to blare through the speakers. The crowd immediately began clapping in time to the music, their WW rings twinkling in the dark of the live house. The WING-MEN entered the stage first and took their places behind the screen which still covered most of the stage. Then the screen lit up and opened revealing RYO:SUKE himself dressed in an all white, holographic outfit and standing illuminated in the center of the stage. The stage went dark and the show began with “シルヴァー (Silver)”. Featuring a synth heavy intro, faced-paced drum beats and metal guitar riffs, it immediately got the crowd headbanging. The band transitioned immediately into the second number “Mr. 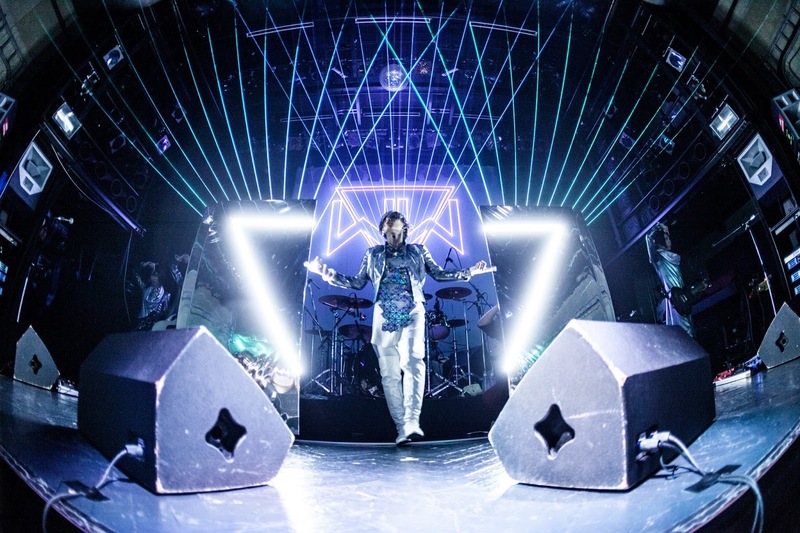 FANTASIX” and RYO:SUKE screamed into the microphone, urging the audience to give more energy. By the third song “ADAM”, WING WORKS had the audience screaming and the whole venue was jumping up and down creating a crazy, fun atmosphere. On stage, RYO:SUKE and the WING-MEN were all energised by the beat and couldn’t keep still. The guitarists jumped around, switching places while RYO:SUKE and Intetsu huddled close together, teasing the audience with fanservice. Despite the limited stage space, WING WORKS made the most of it and went all out with their stage theatrics. “ILLUMINA LUMINALION” had all the members putting on Guy Fawkes masks accompanied by a looming projection of the mask on the screen overhead. The audience went crazy and crowded at the front of the stage forming a moshpit, moving right and left as directed by RYO:SUKE. During each pause in the setlist, techno music would play while the audience chanted and screamed for more. One of the highlights of the night was RYO:SUKE’s performance during “MAD SQUARE GARDEN” a song with a slower, jazzy tempo. He delivered a strong vocal performance with a sensual feel, jacket slipping off his shoulders as he caressed the mic and contorted himself in time with the music, gesturing dramatically. This was one of WING WORKS’ more complex songs where despite the slower tempo, the performance was laced with monologues, hard guitars riffs and fast-paced, piercing guitar solos. The audience was sucked in and stood in silence, transfixed by the performance. The song crescendoed when he flung the mic aside and dropped to his knees, looking around wildly. It ended when he staggers off stage and a single scream echoed through the venue. When the music ended, the WING-MEN standing in the background left the stage without a word. The screen lit up again and continued the story of the android and his fight to save humanity. We were brought back to the year 2033 and RYO:SUKE and the WING-MEN came out again. This time, RYO:SUKE was dressed in all black, blending into the darkness of the stage. From that point WING WORKS’ performance got even more electric. The audience fed off the energy on stage and jumped higher, dancing and headbanging with vigor. In the final song “I’ll die but my CREATION never die.” a multi-layered song with dramatic segments, RYO:SUKE showed more of his dramatic side, collapsing to the floor while singing, then splaying himself out on the floor of the stage. He and the WING-MEN gave the fans extra attention and fanservice, standing at the edge of the stage and touching the hands of the fans who all rushed forward to grab their favorite member. 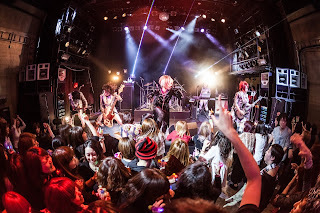 During the instrumental break, RYO:SUKE took a moment to express his genuine gratitude and appreciation of the fans and expressed his ultimate wish that his music would reach each of them in a special way. This heartfelt declaration clearly reached the audience who immediately began chanting for an encore when the stage was deserted and the curtain came down. Their voices were heard and to everyone’s delight, from behind the curtain, the drums began keeping time with their chants. Finally the curtains opened again and everyone came out looking more relaxed in T-shirts and ready for more. The first song in the encore was “ムービングライトキス (Moving Light Kiss)”. The interactions between the members during the performance was extremely light-hearted and playful, adding to the bouncy and upbeat vibe of the song itself. There was a guitar solo in which most of the lights were switched off, leaving only the twinkling of the fans’ rings and laser lights. The crowd stretched their hands towards the stage, showing their support. At the end, there was a break for MC where RYO:SUKE thanked the crowd and made sure they were having fun. He made everyone laugh by exclaiming “This is the most fun I’ve had in my life! Seriously!”. He went on to explain the concept of the Trinity in his works. The original Trinity to him signified God, Angels/Spirits and Humans. In relation to WING WORKS however, it translated to RYO:SUKE, the WING-MEN and the fans. He then performed his newest song at the time “RAVVE OF MY TRINITY” which he described as his “church”. The audience responded with fervor and at the final song “FIXXTION BOY”, you could feel the floor vibrating with the force of everyone jumping. At the end of the show, everyone crowded together for a picture with the audience then held hands and jumped for the final. 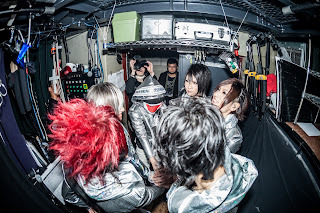 There was a bittersweet moment when it was announced that this would be WING-MEN bassist Intetsu’s last live. Intetsu (ex. Ayabie) would be officially retiring as a performer and moving on to other projects behind the scenes. RYO:SUKE thanked him repeatedly for all his contributions and the audience cheered continually as the two shared a heartfelt hug and then he bowed and left the stage. One of the best things about a WING WORKS live is the creativity that shines through in every performance. RYO:SUKE and the WING-MEN are all experienced performers who brought their own unique energy and style to the stage. With a dynamic setlist ranging from pop sounds to hard rock and techno, WING WORKS delivered an extremely varied live show. Proving his versatility as a performer and an artist RYO:SUKE kept the crowd jumping and waving with increasing energy throughout the entirety of the set. 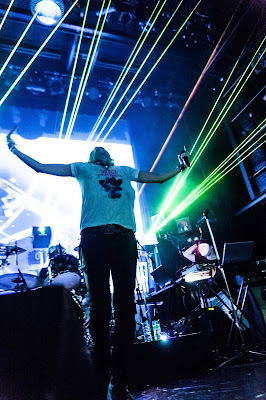 The use of lights, synth and attention to technical detail throughout the show kept the audience immersed in the world that WING WORKS created. I’ll die but my CREATION never die.